A bed rail is a furniture accessory many people don’t think to invest in. People with illnesses or injuries, those with small children sleeping in the same bed, older people who require extra help getting in and out of bed, or even those who simply want some extra security when sleeping may find that investing in a bed rail is an excellent decision. 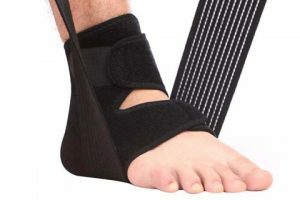 Having one on hand in case of unexpected illness or injury is a good idea as well, as is investing in one simply for an extra safety measure and worry-free sleep. Finding a bed rail that suits the individual user is important, as bed size, sleep pattern, the individual’s body size and weight, and more can factor in and alter the effectiveness of the bed rail. However, lists like the one that follows can be helpful in finding the right bed rail for the right situation. Online shopping is a great place to start, as it allows the consumer to compare prices and other factors without committing or having the pressure of a salesperson who may be driven by commission. 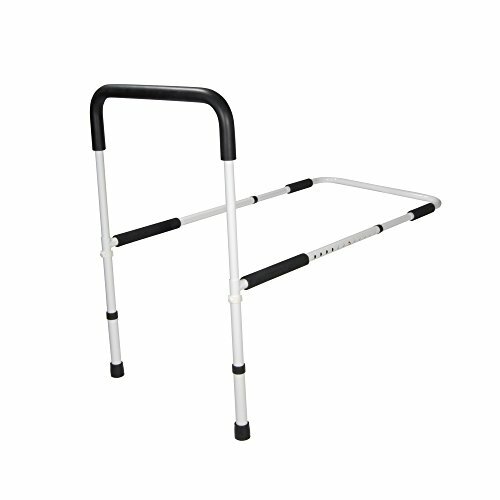 This adjustable length bed rail can also function as a hand rail for getting in and out of bed. Capable of supporting up to 300 pounds, it comes with a pocketed cover that can be used to store various items, such as books, pens, remotes, phones, and more. 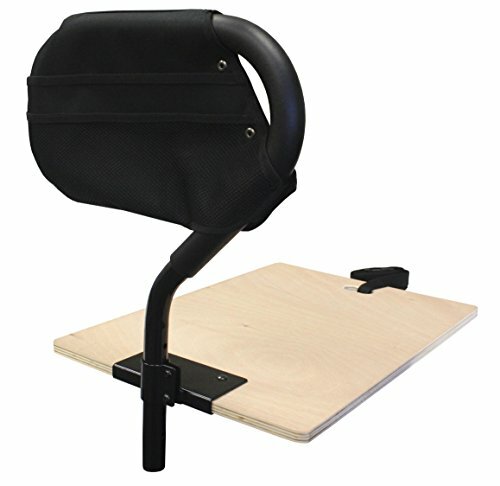 The Ez Adjust can also be adjusted to most hospital and home beds thanks to the adjustable safety strap. This feature makes the bed rail a potential choice for clinics and other medical facilities as well. Another benefit this bed rail offers is that it can be placed on either side of the bed and pivoted down when not in use. Its sleek black construction and dark cover makes it easy to see against a variety of surfaces, making it an excellent choice for the vision impaired. 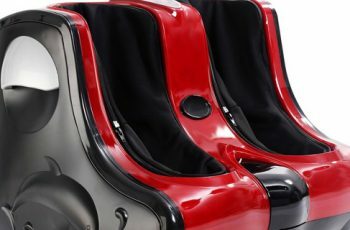 The rounded corners reduce the risk of injury, also making it a good choice for people who have mobility issues, such as the elderly and those with diseases such as Parkinson’s’ or those who have suffered strokes or other neurological distress. 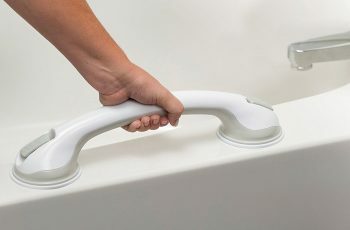 The Home Bed Assist Handle is less of a bed rail in the sense that it is meant to prevent the sleeper from rolling out of bed and more of a movement aid. It is an adjustable handle that helps the user get into and out of bed without risking injury or slippage, as the handle includes no-slip foam on the base board to prevent the handle coming out from under the mattress. This handle is easy to assemble and does not require any tools. 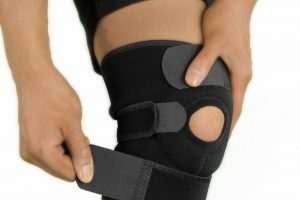 It comes in three pieces with no small parts, making it suitable for all ages and low-risk for those who have trouble with assembling small pieces. 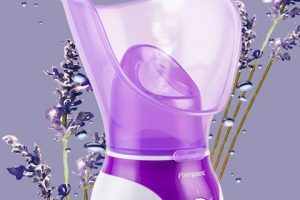 The handle folds flat for easy storage and portability and the handle itself weighs just under ten pounds. This adjustable, smooth-edged bed rail extends from 20 to 30 inches, offering a variety of support and protection options. This handle can fit on either side of the bed and supports up to 300 pounds, making it a considerable option for those with chronic health issues that affect their mobility. 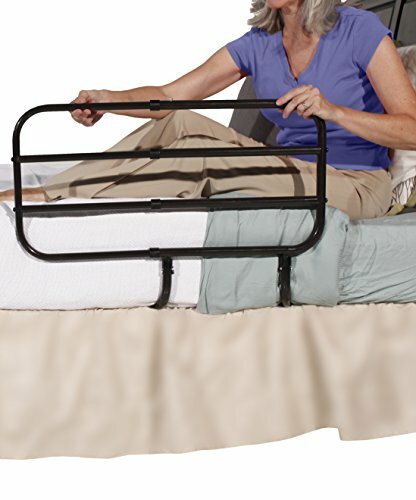 The bed rail is extra secure due to the included security strap that tightly binds the rail to the bed. This handle/bed rail fits most home and hospital beds with mattresses with heights of 8 to 16 inches in addition to its lengthwise extension. The easy adjustment of this rail means that it can be used for both daytime use as a handrail and extended to its longer length for nighttime use. It is light at only 7.2 pounds, making it easy to transport from place to place. Three crossbars make this bed rail less likely to allow blankets, hands, or feet to slip in between and cause injury. 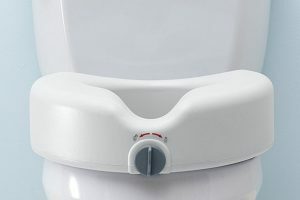 It pivots when not in use, meaning that the user can push it out of the way whenever they like without having to take it off the bed or disassemble it. The safety strap of this bed rail ensures that the user won’t tip over if they sit or lay on the mattress wrong; the strap also helps the rail itself support up to 300 pounds. 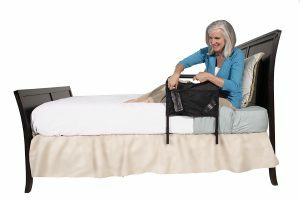 The rail can be installed on either side of the bed and can also be purchased with a pouch that has multiple storage pockets for books, eyeglasses, or whatever else the consumer needs to keep on hand. One of the most prominent features of this bed rail is its narrow design; when coupled with the easy assembly, it is clear to see why this bed rail would be a useful addition to bedroom safety measures. It includes a storage pouch and is simple to set up and use. Another factor that makes this bed rail a good choice is that it is made of tough steel but only weighs six pounds. This light weight makes for a much easier time carrying the bed rail, especially if the customer wishes to take it with them when they travel. It can be adjusted from 36 to 44 inches, allowing for versatility as well as portability. While some customers prefer a wide bed rail that can prevent them from falling out of bed, some prefer something narrower they can use to get in and out of bed without maneuvering around a wider bed rail. 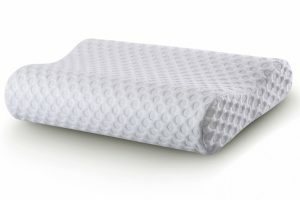 This particular item adjusts in height and comes with a safety strap to securely fit a wide variety of beds. 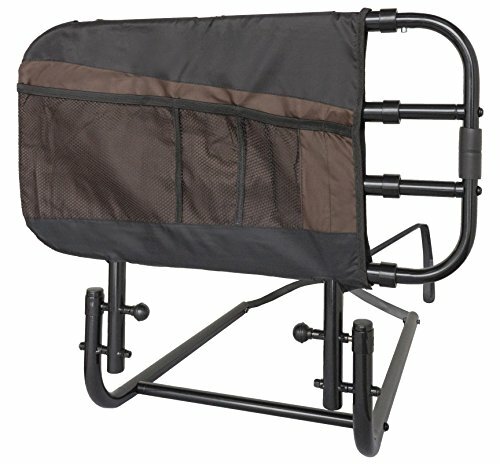 The organizer pouch this bed rail comes with slides easily over the frame and can be used to hold books, medications, or anything else the customer would like to keep within easy reach. 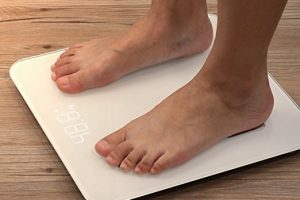 The weight capability of this item is 300 pounds, enabling a more diverse group of people to purchase and successfully use it. This bed rail comes in three easy-to-assemble parts and slides under the mattress, making installation easy and quick. It requires no tools and can be adjusted to fit a wide variety of beds, making it a useful choice for the elderly, disabled, or injured. 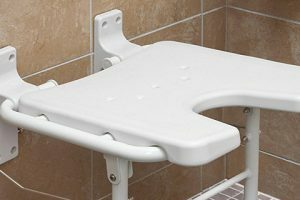 The bed rail adjusts from approximately 30 to 39 inches, enabling users of various heights and ability levels to use it comfortably. It is a bit on the heavier side at 19.7 pounds, but what it lacks in portability it makes up for in durability. 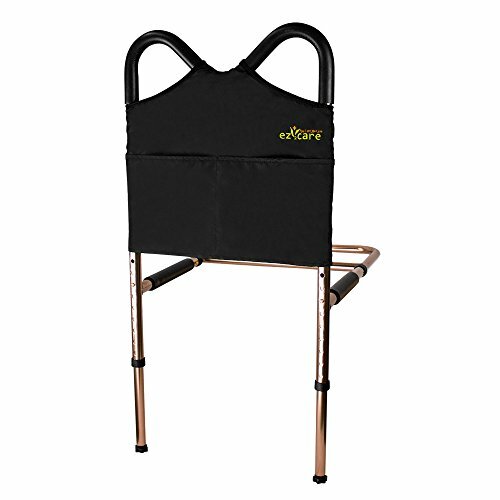 It folds flat, making it a bit easier to transport, as well as comfortably supports up to 250 pounds. 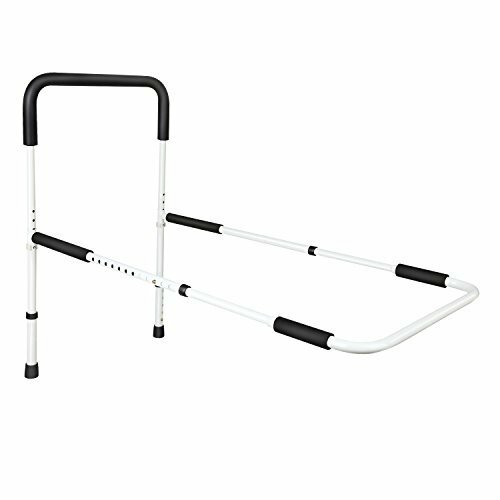 For those who do not need an entire bed rail but still need help getting in and out of bed, this bed cane is ideal. 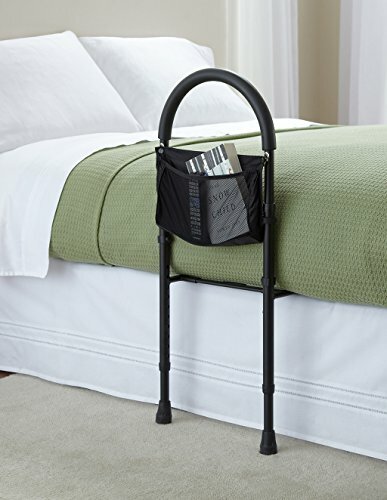 It is made of heavy duty steel with a powder coat finish and includes a safety strap and 4 pocket organizer, helping the user to have a compact and safe way of getting in and out of bed. The bed cane also adjusts from 16 to 21 inches and fits on either side of the bed. 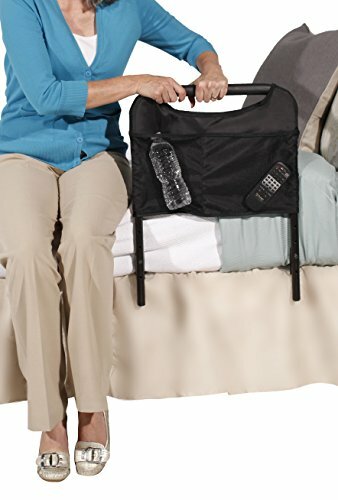 Capable of supporting up to 300 pounds, it boasts a padded ergonomic handle that makes getting in and out of bed easier. It is compact and comes with a bamboo board for maximum stability and security. This aluminum bed rail comes in two easy-to-assemble pieces and boasts an extra long safety strap that can wrap around the mattress for maximum security. 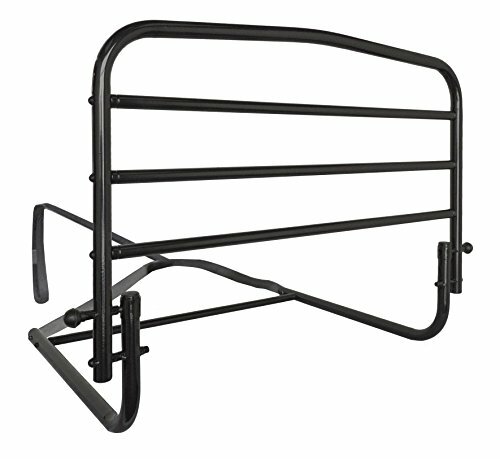 While the frame is aluminum, the bed rail also consists of powder-coated steel for extra strength and durability. The removable handle has multiple crossbars, allowing for an easy grip at any height. This bed rail can be purchased with or without a bedboard, which can be used for extra stability. This bed rail can support up to 250 pounds and fits on multiple sizes of beds, including those with box springs. The Ez2care bed rail is super adjustable with an extendable range from 12.2 to 21 inches above the base and both legs offer 1 inch extensions to ensure a perfect fit with the floor. It comes with a safety strap for increased security and a storage pouch for keeping essentials close at hand. This bed rail slides under the mattress and supports up to 250 pounds. 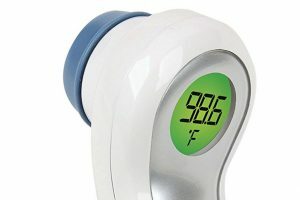 At a lightweight 3.1 pounds, this product is portable and ideal for travel due to its versatility. The curved m-shape top allows for a strong grip no matter the angle, increasing the safety factor of this product.